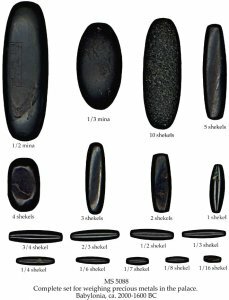 Description	 MSS in Old Babylonian on hematite, Babylonia, ca. 2000-1600 BC, 55 weights of all sizes, from diam. 2,8x8,8 cm to diam. 0,4x1,1 cm, 2 and 1 lines in cuneiform script. Commentary	 The smallest weight is 10 barley-corns. They were reported found together in a damaged bronze pot in the 1920’es – 1930’es. 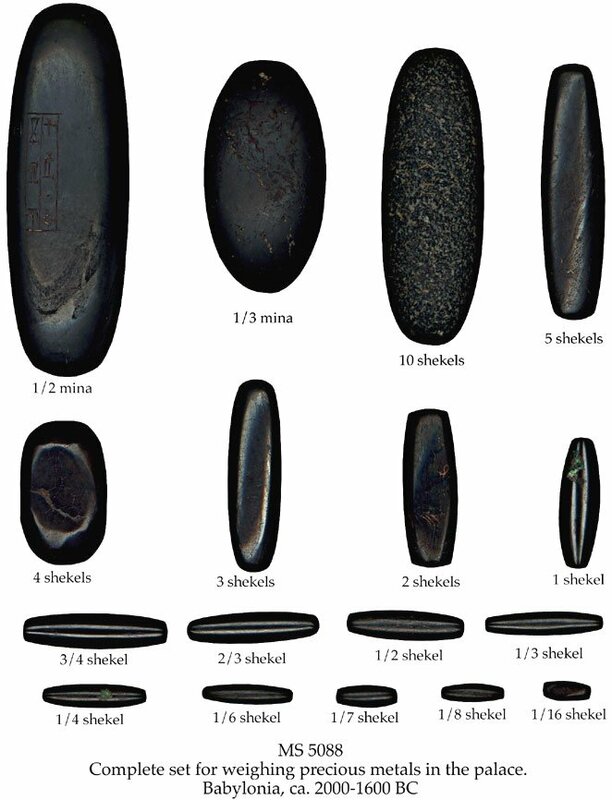 The only known large complete set of weights from the Old Babylonian period. It would mainly have been used for weighing out gold and silver for deliveries to and from the royal palace. Published	 Jöran Friberg: A remarkable Collection of Babylonian Mathematical Texts. Springer 2007. Sources and Studies in the History of Mathematics and Physical Sciences. Manuscripts in the Schøyen Collection, vol. 6, Cuneiform Texts I. pp. 131-133.